At least 15 touch-screen voting machines that produced improbable numbers in Ohio’s 2006 statewide election are now under double-lock in an official crime scene. And the phony “Homeland Security Alert” used by Republicans to build up George W. Bush’s 2004 vote count in a key southwestern Ohio county has come under new scrutiny. The touch-screen machines were locked up after Ohio’s new Democratic Secretary of State, Jennifer Brunner, tried to vote last fall. On November 6, she spotted a gray bar with the words “candidate withdrawn” in a slot where the name of Democrat Jay Perez should have appeared. Her husband, voting nearby, told her Perez’s name did appear, as it was supposed to, on his machine. Perez had been a candidate in the race for Franklin County Municipal Judge. He withdrew his name after the county had finalized its ballots. But it now appears the ES&S machines left his name on some machines but not on others. Perez, a Democrat, wanted to avoid playing a spoiler in the race. But the appearance of his name on some machines may have helped Republican David Tyack win. Ironically, Brunner requested a paper ballot in the March 4, 2008, primary, but a poorly trained poll worker gave her a provisional ballot instead. Two other staffers from her office were also given the wrong ballots. Brunner has since pledged to upgrade the training for Buckeye State poll workers. Brunner further announced that she’s banning the practice of so-called “sleepovers” where poll workers take the programmable and easily hackable voting machines home with them overnight prior to an election day. Brunner succeeded Republican J. Kenneth Blackwell as Ohio’s Secretary of State. She has vowed to make sure the Buckeye State does not repeat the experience of 2004, when Blackwell choreographed the theft of Ohio’s 20 electoral votes for George W. Bush, giving him a second term in the White House. Since taking office Brunner has vowed to shift the entire state to voting on paper ballots, a move being fiercely resisted by numerous Republican-controlled Boards of Elections throughout the state. Thus far Brunner has forced the resignations of BOE chairs in two of Ohio’s most populous cities, Cleveland and Columbus. Matt Damschroder was removed as Franklin County Board of Elections Director on the Sunday prior to Ohio’s 2008 primary election. Damschroder was previously suspended for a month without pay for accepting a $10,000 check from a voting machine salesman at the BOE building. The check, made out to the Republican Party, was delivered on the day the state’s contracts for electronic voting machines were open for bidding. Damschroder was former chair of the Franklin County Republican Party and the state’s leading foe of paper ballots. “Damschroder was very opposed to paper ballots and was stoking the fire against them,” Brunner told WVKO. Dennis White, the new director of the Franklin County BOE was skeptical of the masking problem, but says if it happened, “it’s huge. We have a federal election coming up this November,” according to the Dispatch. White, who admits to having little knowledge of computers, is the former Ohio Democratic Party Chair. That election may once again hinge on Ohio’s vote count. In 2006, Franklin County officials failed to conduct mandated tests on each machine, instead testing only one machine per precinct on a random bases. A report by SysTest Labs, a Colorado consulting firm, confirmed that what Brunner saw on her machine was “exactly what you’d see if someone masked a name,” the Dispatch reported. In the primary this past March, the BOE allegedly did test all Franklin County’s machines. But some counties ran out of Democratic paper ballots as an influx of apparently Republican and Republican-leaning independents flooded the polls, apparently to vote for Hillary Clinton. Meanwhile, the Cincinnati Enquirer has reported that a “casual conversation” between a “friendly” FBI agent and the county emergency services director in a parking lot may have contributed to the phony Homeland Security alert that prompted the Warren County BOE to lockdown the vote count in the 2004 election. The BOE declared the emergency and then moved the ballots from the publicly designated vote center to a nearby unauthorized warehouse. They also barred the public and media from witnessing the counting. Warren County, which is outside Cincinnati, then gave Bush 72% of the official vote count, far exceeding expectations. With neighboring Butler and Clermont Counties, Warren gave Bush a margin of 140,000 votes, which exceeded the 119,000 margin by which he allegedly won the election. The Enquirer reports that “hundreds” of e-mailed complaints poured into the county BOE after the election, including one from an angry voter in the United Kingdom. “Stop destroying our democracy,” said one voter from South Carolina. The Free Press has previously reported that Warren County BOE employees were told on the Thursday prior to the 2004 election day, that there would be a Homeland Security threat on election day. An examination of the ballots by a Free Press investigation team uncovered numerous irregularities in the Warren County vote that helped give Bush the presidency again. What happens when you have “60,000 foreclosures in one month”? Tent cities are popping up outside in Los Angeles as people lose their homes in the mortgage crisis. This is truly sad and yet mainstream media in the U.S. is reporting on the hardships of the banking industry not the middle class tragedy created by the Bush’s White House, Greenspan and Bernanke’s policies along with their print and spend economy. Need more proof we are in trouble? Check this out at Crooks and Liars. Paulson states their on top of the issues relating to the economy. But this…this administration has been focused on this…I think, very early involved…very early, beginning in August. Working very hard to avoid foreclosures that are preventable, putting in in in place programs that are making a difference, are working. Are they going to to prevent the inevitable correction in housing prices? No, but we’re working hard on that and again, I think we were early with the stimulus package. I don’t know about you, but I’m not feeling that the stimulus package with the $300, $600 and $1200 dollar pay-outs are going to help people stay in there homes. Bush Co. and the bankers on Wall Street were hand in hand finding more and more ways to fleece the American public. Where were the federal Reserve regulators for the last two years? Cashing in? Their undoing was they didn’t pay attention to middle American. There have been people screaming we were heading straight for a depression. Ron Paul and the “Mad Money” man Jim Carmer have been sounding the alarms for months. The wealthy elite who lost the gamble can have their whine, Bush and Co. spent all the money for the cheese. 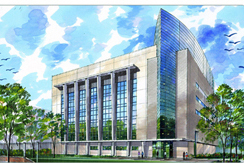 An artist rendering of the National Emerging Infectious Diseases Laboratories in Boston’s South End. The National Institutes of Health (NIH) has established a Blue Ribbon Panel to help determine the environmental risk assessment that the agency will conduct regarding the National Emerging Infectious Diseases Laboratories (NEIDL) currently being built on the BU Medical Campus. The panel, chaired by Adel Mahmoud, a senior molecular biologist at the Woodrow Wilson School of Public and International Affairs at Princeton University, includes 16 experts in infectious diseases, public health and epidemiology, risk assessment, environmental justice, risk communications, biodefense, biosafety, and infectious disease modeling. The agency has also established an internal coordinating committee to help address safety concerns raised by community representatives and by a National Research Council report on the NIH draft supplementary risk assessments. Because the NEIDL, which houses a biosafety level 4 (BSL-4) lab for research on dangerous microorganisms, will be located in a densely populated urban neighborhood, it has been a source of controversy ever since September 2003, when the NIH’s National Institute of Allergy and Infectious Diseases (NIAID) awarded Boston University Medical Center $128 million to build the facility. In November, a committee of scientists convened by the National Academy of Sciences (NAS) concluded that a study released last August by the NIH failed to employ sufficiently rigorous analysis in assessing the risks of locating the lab on the Boston University Medical Campus rather than in a suburban or a rural alternative. That report, conducted by the NAS’s National Research Council, found that the earlier NIH study did not adequately identify worst-case scenarios and failed to provide sufficient information to compare the risks associated with the alternative locations. The Blue Ribbon Panel, which will meet for the first time next week, will act as a working group of the Advisory Committee to the NIH Director, a standing high-level scientific advisory body providing advice directly to the NIH leadership. The panel will provide independent scientific advice regarding the oversight and conduct of the ensuing study and its conclusions. Anthony S. Fauci, the director of NIAID, says the agency will use a transparent process to thoroughly examine any potential risks to the community associated with the project. “The biomedical research conducted in facilities such as the one under construction at Boston University Medical Center is essential for developing vaccines, therapies, and diagnostics to protect the American public against infectious diseases that may occur naturally or be deliberately introduced,” says Fauci.